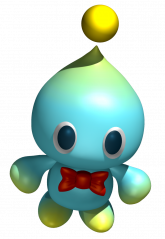 Cheese the Chao is a blue neutral baby Chao, sibling of Chocola the Chao, and pet of Cream the Rabbit. Cheese wears a red bow tie. A couple of times in Sonic X, the other characters referred to Cheese as "she", but in Sonic Heroes, Cheese is identified as male. This is most likely a moot point, however, as the A-life chao of Sonic Adventure and Sonic Adventure 2 had no genders. Cheese's first appearance was in Sonic Advance 2 for the Game Boy Advance handheld console. In the game Cheese is accompanied by Cream the Rabbit, and is used as a method of attack. Cheese subsequently accompanies Cream in all her game appearences, with a first 3D outing in Sonic Heroes, where Cheese follows Cream and helps her look for Cheese's sibling, Chocola. Cheese also appears in Sonic Advance 3, and as usual follows Cream; here Cheese is shown to be able to morph into a Sonic, Tails, Knuckles, or Amy -style Chao when the relevant character uses the tag action. Cheese serves as Cream's primary means of offense in Sonic Battle, where the chao is an integral part of her moveset. Cheese the Chao is also in the newest television cartoon, Sonic X although he/she is notably larger than his/her video game self. Description: Greatly increases the luck of all team members. Cheese also appears in Sonic Chronicles: The Dark Brotherhood. 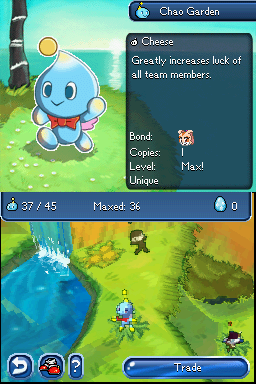 During this game, chao eggs can be found scattered around the stages, and once hatched, the chao take up residence in the chao garden. From here they can be equipped to accompany characters into battle, where the different chao confer various beneficial status effects. Cheese, uniquely, is not hatched in the Garden, but instead acquired by Knuckles during the quest to recruit Cream in the Green Hill Zone.